If you’re looking for a relocation service in Washington, DC, we hope you would choose Artisan Movers. We are experienced in the industry, and we ensure that every customer receives the highest quality of service when seeking DC movers. While our headquarters is based in Rockville, Maryland, we provide moving services for all of Maryland, DC and Virginia, whether it’s a local or long distance move. Many Washington DC movers simply use a one size fits all approach to moving their customers, but we don’t. Our customers receive VIP treatment. This means that we provide services that are tailored to your needs. If you choose us, VIP service doesn’t come with a VIP price. In fact, our services are quite affordable. 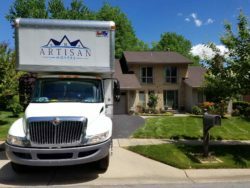 Artisan Movers is a family owned and operated company, and we are federally licensed by the Department of Transportation (DOT) and the Federal Motor Carrier Safety Administration (FMCSA) and are fully insured as well. If you’d like you can look us up on their site to confirm we are a legitimate moving company. We can help you move within DC, across the country, or anywhere in between. If you’ve never moved before, we can help to guide you through the process to make it as stress free as possible. We ensure that all of your belongings remain safe during transport. The boxes and padding that we use are designed to provide your belongings with an exceptional level of protection. We use special boxes and packaging for fragile materials. In addition the vehicles are inspected to ensure that they will remain in working order throughout the trip. 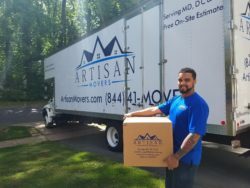 Unlike some Washington DC movers, Artisan Movers can help you to move your business anywhere within the country. We have experience moving files that contain confidential information, and we take steps to ensure that these files remain safe from prying eyes during packing, unpacking, and transit. If you have fragile technology that needs to be moved, we will take extra care when moving these items. Your business’ fragile items will be treated with the utmost care while being transported. We also will help your staff to prepare for the move. We have worked with both small and large businesses, and we can work with businesses in nearly any industry. our expert packers so that nothing gets broken and it all gets done in time to load up the truck for your move. We we pack this helps expedite your moving process and ensures that your belongings remain safe during the move. If you prefer to pack yourself that’s fine. We can provide you free delivery of packing material so you don’t need to bother going to the store and lugging back tons of material for your move. We can do the handwork for you. We also provide free use of wardrobe boxes with each move so you can save your money on that as well. Many movers in DC don’t offer storage, but we offer both short and long term storage. You can store as much or as little as you want in our storage center. The storage that we offer is climate controlled, and this helps to prevent mold growth. In addition, our storage center is designed to be exceptionally secure from break ins and theft. We also ensure that the storage facility is free of rodents and insects. Our storage services are also quite affordable. What Should I Do If My Moving Date Changes? If your moving date changes, we are flexible. All you need to do is give us a call and inform us of the new date. Then, we will be able to find a new date for our arrival that is best for your schedule. Can You Cancel Our Services? If you end up needing to cancel your move, just give us a call. Insurance can cover any losses caused by damage to property that occurs during transit, but we are confident that your belongings will arrive safely. What Experiences Have Customers Had With Us? We don’t drag our feet. They would recommend our services to a friend. That we allowed the move to be stress free and pleasant. Customers have said that they wouldn’t hesitate to use our services again in the future. Whether you’re looking for Washington DC Office Movers or residential movers, Artisan Movers can help you with your local or long distance relocation. You can learn more about us on our homepage. You can also get a hassle free estimate by giving us a call at (844) 416-6837 or completing the form at the top of the page.